Aphid colonization on older leaves varies depending on plant type. Growth rate and reproduction are higher on lower leaves compared to upper leaves. For example, chrysanthemum (Dendranthema x grandiflorum) cultivars may vary in their susceptibility to aphids, such as the green peach aphid (Myzus persicae), primarily due to the nutritional quality of specific cultivars. In fact, the nutritional quality or nutrient content of a plant and cultivar may be strongly correlated with susceptibility, a relationship associated with the concentration of amino acids in plant tissues and attractiveness of plants to aphids. Amino acids are required by insects for growth, development, and reproduction. Aphids feed within the phloem sieve tubes and may select developing leaves of certain cultivars with higher concentrations of amino acids in the phloem. The number of aphids that colonize plants varies depending on cultivar, which is affiliated with nutritional quality or nutrient content. In addition, studies suggest that aphids select plants that are more favorable for reproduction. For example, reports indicate that green peach aphids prefer feeding on certain cultivars in order to enhance reproduction. Furthermore, development time may differ depending on the cultivar fed upon. Therefore, differences in life span and reproduction may occur in green peach aphid populations when feeding on different chrysanthemum cultivars. 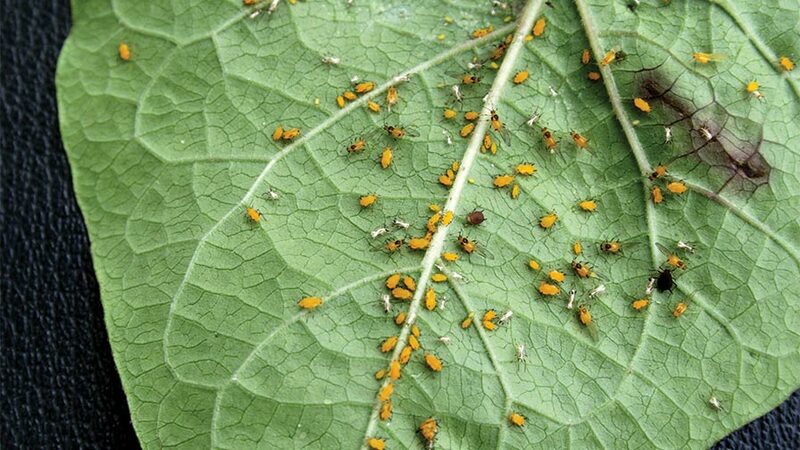 In fact, on some chrysanthemum cultivars, the reproductive rate is higher when aphids, including the green peach aphid, feed on the leaf underside than the topside of leaves. Any enhancement in reproduction may directly affect the efficacy of both insecticides and biological control. For instance, more frequent insecticide applications may be needed, due to the numbers of aphids produced over a given time period, which could increase aphid populations developing insecticide resistance. Moreover, the reproductive potential of aphids on susceptible crops, including chrysanthemum, may result in biological control agents/natural enemies, such as parasitoids and predators, not being able to effectively regulate populations, compared to aphids on less-susceptible crops. This may be due to the difficulty in keeping-up with the number of aphids produced within a short period of time. Aphids will re-distribute themselves as plants grow, resulting in variations in vertical distribution. In most cases, the terminal growth is the primary region of the plant where aphids tend to aggregate and feed. For instance, on certain chrysanthemum cultivars, green peach aphid populations migrate upward to the top portions as plants form buds. As flower buds develop, changes in the concentration of amino acids may occur in the leaves resulting in the foliage being more suitable for aphids; thus supporting higher numbers of individuals, in comparison to non-flowering plants. As plants flower, there is an increased suitability of the upper leaves of flowering plants. This changes the distribution of aphid populations as they continue to move upwards and aggregate on flowers and upper leaves. The movement upwards during flowering may account for the sudden appearance of aphids feeding on flowers. Aphid preference for the upper leaves may influence control by increasing exposure to contact insecticides and natural enemies, although open flowers may protect them from exposure to contact insecticides and possibly even natural enemies. Aphids that colonize the terminal growth may be easier to control than those that reside on mature leaves or leaf undersides, because they can be difficult to contact with insecticides in these locations. Also, when aphid populations get too crowded, they become more mobile by forming winged individuals, and consequently, they re-distribute themselves among surrounding plants. These changes in distribution may influence both insecticide efficacy and the ability of natural enemies to effectively regulate aphid populations. When aphid populations get too crowded, aphids form winged individuals to re-distribute themselves among surrounding plants. Although aphids, in general, tend to aggregate on the terminal growth of plants, some aphid species differ in their distribution on plants. For instance, populations of the melon aphid (Aphis gossypii) tend to move and aggregate on the lower leaves; whereas, green peach aphid populations move and aggregate on the upper leaves. Aphids may move upwards as plants grow, although the green peach aphid will disperse more rapidly than other aphid species. Aphid movement may be related to the mobilization of essential amino acids in the phloem tissues of the plant with developing and terminal leaves having higher levels of amino acids than older or senescing leaves. As a result, some aphid species do not colonize older or senescing leaves. This may be related to a decrease in nutritional quality or nutrient content. As leaves age or senesce, they tend to support fewer aphid populations. Aphids tend to be less visible and may be harder to detect on the older, lower leaves when monitoring. However, aphid colonization on older leaves varies depending on the type of plant. Green peach aphid, for example, on potato (Solanum tuberosum) plants, has been reported to prefer the lower, older leaves, which are the first leaves to senesce. Growth rate and reproduction are higher on lower leaves compared to upper leaves, a factor associated with the composition of the phloem sap of senescing leaves changing from primarily carbohydrates to predominantly amino acids. Therefore, because reproduction and amino acid concentration are related, this may be the reason why green peach aphids prefer the lower leaves of potato plants more than the upper leaves. Aphids, in general, tend to aggregate on the terminal growth of plants, but the type of aphid species and plant architecture can also affect distribution on plants. The development of winged aphids may be attributed to a decline in the nutritional quality of the plant, variation in plant chemistry, or crowding. If the number of aphids on plants results in crowding, then aphids will move downwards on the plant and possibly produce winged individuals. Moreover, winged adults can fly, and tend to aggregate at the top of the plant and give birth to live offspring after locating a new host plant. By the time growers start noticing winged aphids, it may be too late to initiate plant protection measures because of the number of aphids present, which may negate the use of either insecticides or natural enemies. The dispersion and feeding behavior of aphids on plants may influence the ability to suppress or regulate populations with either insecticides or natural enemies. Plant size, age, and plant mass are usually associated with plant architecture (number of leaves and branches), and may influence aphid dispersion and even control in regard to inhibiting coverage of plant parts with insecticides. 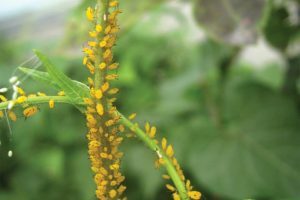 Aphids that are located in the interior canopy of the plant may escape exposure from insecticide applications and possibly even natural enemies. The vertical distribution of aphids on plants may impact the efficacy of contact insecticides by negatively affecting coverage. Understanding within-plant or vertical distribution of certain aphid species may be helpful in monitoring aphid populations prior to dispersal (movement) on plants, and in detecting populations early enough to prevent outbreaks from occurring. The distribution of aphids on plants may vary depending on the aphid species, plant type, and cultivar, which could directly or indirectly impact the ability to suppress aphid populations with either insecticides or natural enemies, such as parasitoids or predators. Because aphids tend to feed on certain plant cultivars that are higher in nutritional quality or nutrient content, one recommendation is to avoid over-fertilizing plants with nitrogen-based soluble fertilizers. Another option, in terms of plant protection, is for producers to grow less susceptible cultivars. 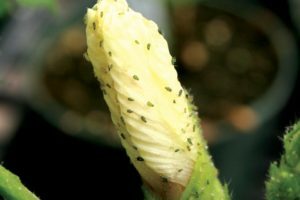 This approach may limit aphid outbreaks; however, this option may not be feasible because the information will not be known until plants are grown in greenhouses or in the field. Raymond A. Cloyd is a professor and Extension specialist in ornamental entomology and integrated pest management in Kansas State University's Department of Entomology. See all author stories here. Aphids, White Fly, Thrips or Shore Fly . We know these insects will affect our flowering crops. It is just a matter of when? From my experience most insect infestations come from the byproducts produced by our growing process. We feed large amounts of fertilizer to the plants and growing media. The plant can only absorb a specific amount of the minerals. In turn the minerals are left behind in the growing media. This mineral build up allows for the production of algae and can form watering tracks in the media. This algae growth allows for the propagation of many different insects. We are not going to change the way we grow, we grow this way in order to achieve taste, color, size and quality of our products. If we keep the minerals flowing either to the plants or to the drain then they can not build up. If there is no mineral build up no organic growth and so on. I know that we monitor the EC levels in our crops. Once to high we flush our media with clear water. This does help to some degree however we still have excess mineral accumulation. If we add a good surfactant to the water. One that has a neutral Ph, works well in hard water and will help to make the water wetter. Then we can see that the surfactant does not change the way we grow. It only changes the way the by products of growing are dispersed. DDAC has seen a lot of new uses as a surfactant and seems to be a great overall sanitation solution. Remember no mineral build up, no organic growth maybe, just maybe less insect pressure. Grow indicator crops which attract aphids like Cineraria. When the indicators show pest pressure you can bag, spray and kill the aphids before they begin their polycyclic growth phase. Indicator crops seem more effective than yellow or blue sticky cards. Be sure to inter space indicators throughout you benches and especially near doorways and incoming vents. I use tobacco plants to attract and dispose of aphid colonies. I have a mixed greenhouse with crops grown in soil and crops grown hydroponically. My hydroponic lettuce has a much greater population of aphids than my soil grown lettuce. I believe it’s because of the high nitrogen levels in the hydroponic lettuces compared to the soil grown lettuce.